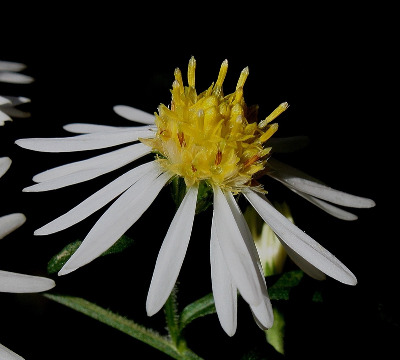 Aster ontarionis of Michigan Flora. Forested river banks and floodplains; moist thickets and forests, whether oak-hickory or beech-maple, rarely in other forest types or open areas (presumably at the edges of forests). Looking very much like a hairier S. lateriflorum, this species, however, is colonial from long-creeping rhizomes. Plants with the leaves glabrate have been called var. glabratum (Semple) Brouillet & Bouchard. MICHIGAN FLORA ONLINE. A. A. Reznicek, E. G. Voss, & B. S. Walters. February 2011. University of Michigan. Web. April 21, 2019. https://michiganflora.net/species.aspx?id=488.